As a Master of Business (Research) (Management) student I have just commenced the most exciting part of my research – data collection! My study is qualitative in nature, with my data being captured through approximately 30 interviews. With about 20 questions, each interview will probably go for up to 60 minutes. After a lot of discussion with my supervisor regarding interview technique, and revising the interview question schedule a few times, we were finally ready to go. The last piece of the puzzle was a RELIABLE way to record how the subjects of my research were responding to my questions. 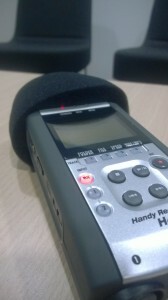 use a dedicated digital voice recorder . In the end, I went down the path of a dedicated piece of audio recording hardware – for me it reduced the risk of losing data. This was really important for me – as a part time research student I don’t have the luxury of time (and to be honest the patience) to go back and re-interview people if I lose the data due to a software crash. After an exhaustive look at a lot of different voice recorder options from brands like Olympus, Sony, Panasonic, TASCAM and more… I settled on the Zoom H4n . With the room and my subject’s calendars booked, it was time to set up for my interviews. I used a reasonably relaxed, out of the way room in our office. 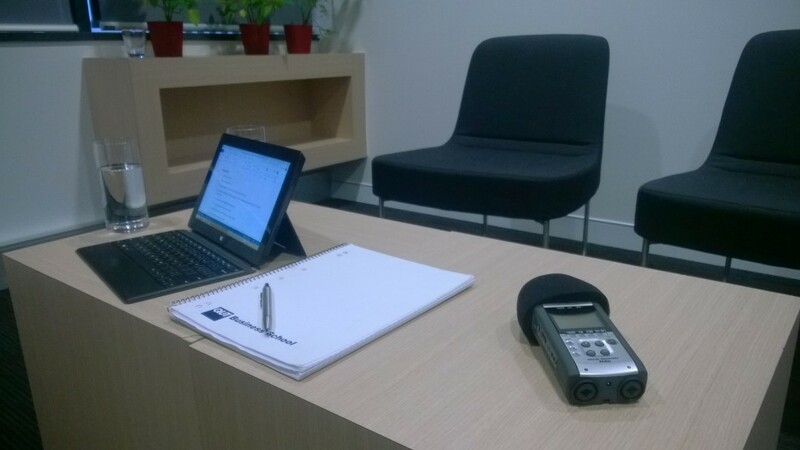 My room setup was pretty simple – with me I had my laptop (which had my interview questions loaded on it), my notebook and pen, a class of water… and my Digital Audio Recorder to capture everything that both the interviewer (me) and my interviewees say. One of the things you need to try to do in any qualitative research interview is to ensure that your subject is as comfortable as possible. 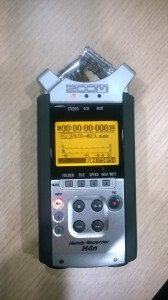 The Zoom H4n does look a little imposing at first sight – which could raise the heart rate of any one you talk to. 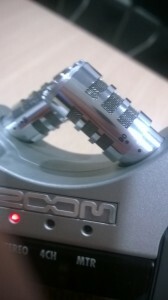 In fact one person commented when they first saw my Zoom H4n that it “looked like a taser !”. Fortunately this can be overcome by using the windshield which comes as standard with the Zoom H4n. 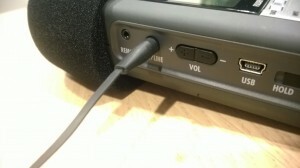 Simply cover the built in microphones with the wind shield, and the device looks like a much friendlier microphone. As I wasn’t near a power point, ensuring that you have a fresh set of AA batteries on hand is very important. The Zoom H4n should record for about 6 hours on a fresh set of good quality AA batteries. Switching to the stamina mode by popping the battery cover off and sliding the Stamina switch on will almost double the life of the device – perfect if you plan to spend a bit longer in the field, or have some of your interview subjects telling some very, very detailed (or very waffly) stories! Just before my first victim subject arrived, I turned on the device to do a quick test run of the audio. I got out a pair of earbuds which came with my mobile phone, and plugged one end them into the side of the Zoom H4n, and the other ends into my ears. To test the recording levels I simply pressed the “REC” button once. I sat in my “interviewer” chair and said a couple of the questions out loud – it sounded very clear and had good volume. I then sat in the “interviewee” chair and repeated the process. Again sound quality and volume was very good – I was good to start. I removed the headphones as I wouldn’t need them for the rest of the day, and hit the “STOP” button. Now just a few more nervous minutes needed to pass until my first interview candidate would arrive. My first interview went for approximately 45 minutes – lots of great content and very vivid stories which will contribute to a some great discussion in my thesis. Once the interview had finished, I simply hit the “STOP” button and the recording was saved to my SD card. The Zoom H4n really did it’s job! I just wish it could transcribe the recording for me as well! The good thing is that the quality of audio is so good that it really makes transcribing a breeze – whether you do it yourself, try to use machine based transcription, or outsource your transcription to a 3rd party provider.